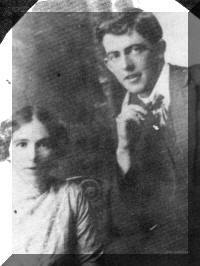 3-Edwin Percy Walker was born on 8 Nov 1892 in Westbury, Tasmania and died on 18 Jan 1967 at age 74. Edwin married Elvie Elizabeth Tuthill, daughter of Robert Tuthill and Margaret Stanley, on 28 Apr 1915 in Holy Cross Church, Elizabeth Town, Tasmania. Elvie was born on 13 Apr 1890 in Deloraine, Tasmania and died on 24 Oct 1959 at age 69. Ted (as he was known) spent his younger days in the Exton district. He married Elvie Elizabeth Tuthill at the Church of England, Elizabeth Town. A few months before he was married he was working at Spreyton helping to set out the apple orchards. One very dark night on his way to Spreyton riding horseback through the "Forest", as it was known then, he was "set upon" by two men who tried to take his horse. The horse was a big lively horse and Ted gave him the spurs and he knocked the men to the ground. It was told that Ted never stopped until he got to Latrobe. In his early married life he lived at Exton and worked for a farmer for 7/6 per week and the "run of a dog" and a house being provided. He also worked at Devonport, Latrobe and Spreyton, but most of his life was spent as a contractor in the orchards at Spreyton. Ted joined the Garrison during the war but was discharged when his eldest son joined up. Ted and Elvie had three children, one daughter and two sons. Ted was a devoted husband and father, and they had a very happy and contented home life.Ted's sporting interests were football, cricket, hunting and fishing. Ted died on 18th January, 1967 and Elvie in 1959 after a long illness. 4-Claude Robert Walker was born on 18 Mar 1916 in Latrobe, died on 18 Apr 2005 in Mersey Hospital Latrobe at age 89, and was buried on 22 Apr 2005 in Mersey Vale Memorial Park. He served in the Second World War. Claude married Kathleen Adella Wells. Kathleen was born on 23 Jan 1922. They had 17 children: Darrell Claude, Rex Allan Maxwell, Robert John, Robin Edwin, Kathleen Alice, Suzanne Mary, Christine Maree, Karen Claudine, Claudia Adell, Garry Richard, Markus Anthony, Dean Milton, Janice Elizabeth, Michael Francis, Simon Christopher, Debbie Marissa and Brendan Scott. 5-Darrell Claude Walker was born on 20 May 1940. 5-Rex Allan Maxwell Walker was born on 11 May 1941. Rex married Eileen May Summers. Eileen was born on 4 May 1937. Rex next married Clare Burk. Clare was born on 20 Feb 1945. They had two children: Troy and Sandra. 6-Troy Walker was born on 3 Mar 1969. 6-Sandra Walker was born on 28 Nov 1971. 5-Robert John Walker was born in Nov 1943 and died on 17 Mar 1981 at age 37. Robert married Judy Aichison. Judy was born on 22 Feb 1942. They had two children: Jody and Andrew. 6-Jody Walker was born on 31 Dec 1968. 6-Andrew Walker was born on 17 Aug 1971. 5-Robin Edwin Walker was born in Nov 1943. Robin married Dorothy Horton. Dorothy was born on 2 Feb 1940. They had two children: Lynette and Peter. 6-Lynette Walker was born on 13 Jun 1969. Lynette married Rodney Johnson. They had three children: Clint, Adelle and Monique. 6-Peter Walker was born on 14 Sep 1974. 5-Kathleen Alice Walker was born on 27 Feb 1947. Kathleen married Peter Phlapp. Peter was born on 6 Nov 1945. They had two children: Karen Louise and Scott. 6-Karen Louise Phlapp was born on 7 Nov 1966. 6-Scott Phlapp was born on 7 Mar 1969. 5-Suzanne Mary Walker was born on 30 Mar 1948. Suzanne married Tony Riley. Tony was born on 9 Dec 1947. They had two children: Sharon and Toni Maree. 6-Sharon Riley was born on 14 Jan 1967. 6-Toni Maree Riley was born on 17 Jun 1978. Suzanne next married David Lister. David was born on 25 Apr 1942. They had two children: Craig and Kerri Lyn. 6-Craig Lister was born on 26 Jun 1969. 6-Kerri Lyn Lister was born on 7 Jul 1971. 5-Christine Maree Walker was born on 19 Nov 1950. Christine married Colin McDougal Russell. Colin was born on 27 May 1947. They had three children: Debbie Maree, Kellie and Simone. 6-Debbie Maree Russell was born on 3 Jun 1967. Debbie married Philip Sims. 6-Kellie Russell was born on 7 May 1970. 6-Simone Russell was born on 30 Jul 1974. 5-Karen Claudine Walker was born on 20 Sep 1953. Karen married Scott Barker. Scott was born on 4 May 1947. They had two children: Kath and Martin. 6-Kath Walker was born on 11 Feb 1971. 6-Martin Walker was born on 11 Feb 1972. 5-Claudia Adell Walker was born on 20 Sep 1953. Claudia married Murray Lethborg. Murray was born on 13 Jul 1947. They had two children: Jason and Kylie. 6-Jason Lethborg was born on 31 Mar 1971. 6-Kylie Lethborg was born on 2 Sep 1973 and died on 8 Apr 1976 at age 2. 5-Garry Richard Walker was born on 22 Apr 1955. Garry married Debbie Maxwell. Debbie was born on 13 Jul 1961. They had three children: Stephen, Benjamin and Samuel Garry. 6-Stephen Walker was born on 7 Mar 1978. Stephen married Annel. 6-Benjamin Walker was born on 22 Dec 1980. Benjamin married Petalyn. 6-Samuel Garry Walker was born on 12 Jun 1987. 5-Markus Anthony Walker was born on 19 Jun 1957 and died on 8 Apr 1964 at age 6. 5-Dean Milton Walker was born on 12 Aug 1958. Dean married Julie Aherne. Julie was born on 28 Oct 1960. 5-Janice Elizabeth Walker was born on 21 Nov 1959 in Devonport. Janice married David Graham Hooper, son of Graham Leslie Hooper and Margaret Fair, on 11 Mar 1977 in Methodist Church, Devonport. David was born on 13 Sep 1957 in Burnie, Tasmania. They had four children: Christie Adele, Mathew David, Andrew Graham and Katie Elizabeth. 6-Christie Adele Hooper was born on 15 Jul 1981 in Devonport. Christie married Jarrod Clark in Devonport. They had two children: Indya Adele and Harley Rose. 7-Indya Adele Clark was born on 8 Jun 2002. 7-Harley Rose Clark was born on 12 Mar 2010. 6-Mathew David Hooper was born on 30 Nov 1983 in Devonport. 6-Andrew Graham Hooper was born on 7 Mar 1985 in Devonport. Andrew married Samantha Weaver. They had one son: Noah David. 7-Noah David Hooper was born in Feb 2011. 6-Katie Elizabeth Hooper was born on 21 May 1987 in Devonport. 5-Michael Francis Walker was born on 22 Dec 1959. Michael married Jane Dorothy King. Jane was born on 20 Jan 1964. They had two children: Todd Michael and Rachel Jane. 6-Todd Michael Walker was born on 22 Jun 1984. 6-Rachel Jane Walker was born on 1 Oct 1986. 5-Simon Christopher Walker was born on 28 Sep 1962. 5-Debbie Marissa Walker was born on 28 Sep 1962. Debbie married Peter Thornton. Peter was born on 9 Jan 1960. Debbie next married Jim Clark. 5-Brendan Scott Walker was born on 12 Sep 1964. Brendan married Paula. 4-Alan Herbert Walker was born on 6 Nov 1921. Alan married Betty Kathleen Mason. Betty was born on 16 Jun 1921 and died on 9 Aug 1986 at age 65. They had three children: Margaret Anne, John Allan and Laurence Keith. 5-Margaret Anne Walker was born on 1 Sep 1946. Margaret married Brian Leslie Simpson. Brian was born on 28 Oct 1943. They had three children: Jodie Anne, Patricia Lesley and Alicica Elvie. 6-Jodie Anne Simpson was born on 19 Dec 1967. 6-Patricia Lesley Simpson was born on 5 Sep 1969. 6-Alicica Elvie Simpson was born on 16 Dec 1972. 5-John Allan Walker was born on 31 Aug 1947. John married Vonda Blake. Vonda was born on 26 Nov 1948. They had three children: Tracey Annett, Ricky John and James Allan. 6-Tracey Annett Walker was born on 12 Jun 1971. 6-Ricky John Walker was born on 25 Dec 1979. 6-James Allan Walker was born on 8 Feb 1983. 5-Laurence Keith Walker was born on 30 Dec 1948. Laurence married Francis Margaret Ling. Francis was born on 25 Oct 1951. They had three children: Michelle Marie, Craig Andrew and Adrian Laurence. 6-Michelle Marie Walker was born on 21 Mar 1971. 6-Craig Andrew Walker was born on 4 Nov 1973. 6-Adrian Laurence Walker was born on 19 Dec 1976. 4-Lillian Frances Walker was born on 10 Nov 1927. Lillian married Peter Dakin Morris. Peter was born on 27 Oct 1933. They had three children: Terrance James, Jennifer Elizabeth and Rodney Keith. 5-Terrance James Morris was born on 25 Mar 1951. 5-Jennifer Elizabeth Morris was born on 26 Jun 1955. Jennifer married Michael Daniel Rundle. Michael was born on 14 Feb 1952. They had two children: Thomas Michael and Nicholas James. 6-Thomas Michael Rundle was born on 23 Jan 1984. 6-Nicholas James Rundle was born on 1 Apr 1986. 5-Rodney Keith Morris was born on 27 Nov 1958. Rodney married Sue Rowe. Sue was born on 13 Feb 1957. They had one son: Andrew Paul. 6-Andrew Paul Morris was born on 12 Feb 1987. Rodney next married Rexine Julie Wilks. Rexine was born on 9 Oct 1957. They had one son: Aaron Rodney. 6-Aaron Rodney Morris was born on 10 Oct 1980.